Robert Indiana. One Through Zero, 1980 - 2003. Corten Steel. Dimensions of each Number: 72 x 72 x 36” (overall including base 78 x 74 x 38”). © 2017 Morgan Art Foundation / Artists Rights Society (ARS), New York. Edition 5/6. Photo by Tom Powel Imaging. They fill my life even more than love. We are immersed in numbers from the moment we are born…. By creating them, I’ve invested those numbers with a quality they have never had before. *"– Robert Indiana. 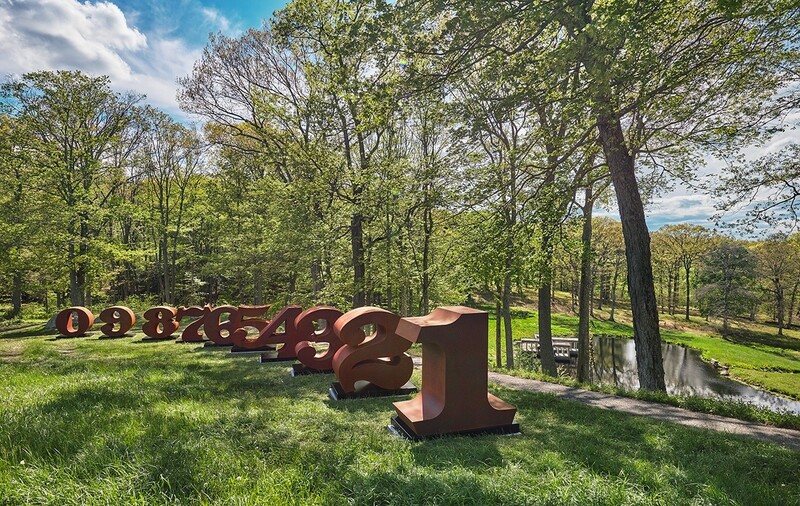 Stenciled numbers and letters were features of the wooden sculptures that first attracted Philip Johnson’s attention to Indiana’s work. When Indiana’s sculpture LAW (1960-62) was exhibited in 1962 at The Museum of Modern Art, Johnson purchased the work, invited Indiana to visit the Glass House and proposed that the artist might create a work for the New York State Pavilion that Johnson was designing for the upcoming World’s Fair. (Johnson subsequently donated LAW to MoMA’s permanent collection.) In late October 1962, Johnson purchased Indiana’s painting A Divorced Man Has Never Been the President (1961) from the artist’s first solo exhibition at Stable Gallery and installed the work at the Glass House. Indiana became one of ten artists (including Ellsworth Kelly, Robert Rauschenberg, James Rosenquist and Andy Warhol) to create works for the exterior of the New York State Pavilion at the World’s Fair. When the New York State Theater — also designed by Philip Johnson — opened at Lincoln Center in 1964, the poster for it was based on a painting created by Indiana for the New York State Theater’s lobby. The image featured elements that by this time were signatures of Indiana: letters and numbers executed in a bold, stencil-like style. As art historian and curator Barbara Haskell explains,“Numbers had appeared in Indiana’s work even before words, functioning variously as the abstract ‘names’ of his anthropomorphic herms, as metaphors for the passage of time, and as reminders of vernacular American culture.” Several suites of paintings in the 1960s and 1970s—including The Numbers (1965) and Decade Autoportraits (1972-1976) were significant precedents for the monumental sculptures of ONE through ZERO. *Robert Indiana, cited in Indiana’s Indianas: a 20-year Retrospective of Paintings And Sculpture from the Collection of Robert Indiana. Exh. cat. (Rockland: William A. Farnsworth Library and Art Museum, 1982), p. 7.